Annuities are insurance contracts that you can purchase to provide a stream of income for as long as you live. Think of them as life insurance in reverse. With life insurance, you pay premiums periodically while you are alive and your beneficiaries receive a large lump-sum payment when you die. Annuities are just the opposite — you pay a large lump sum to the insurance company up front and they make periodic payouts to you until you die, no matter how long that might be. 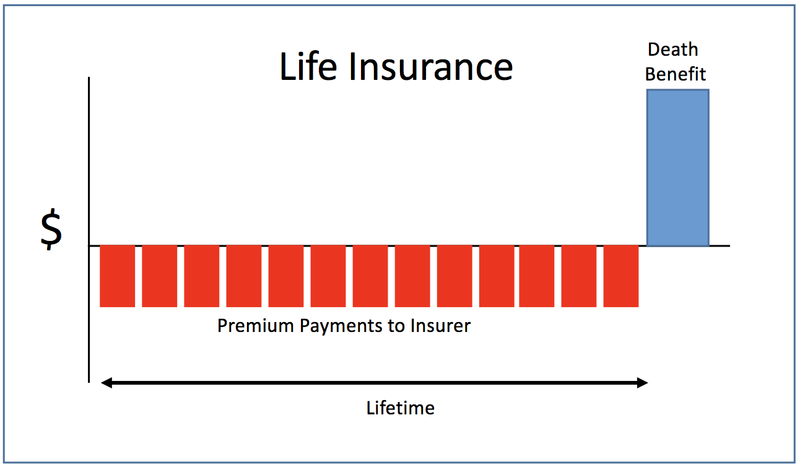 The following diagrams show the cash flows for life insurance, single-premium immediate annuities (SPIAs) and deferred income annuities (DIAs). Blue cash flows go to you and red cash flows represent payments you make to the insurance company. The difference between an immediate annuity and a deferred income annuity is that immediate annuities begin payouts in less than one year, while deferred income annuity (DIA) payouts can be deferred for many years. I can purchase a $500,000 single premium immediate annuity today and begin receiving payouts next month if I wish. I can purchase a $100,000 single premium deferred annuity today and elect to not receive those payouts for ten years, for example, if I prefer. Why would I want to defer an annuity’s payouts? Because deferred annuities and immediate annuities solve two different retirement problems. Immediate annuities can be purchased at the beginning of retirement to help provide a lifetime of safe "floor" income. Retirees with little secure income may want to augment that safe income with an immediate annuity. Retirees with significant Social Security benefits and a pension may have plenty of safe income and not need an immediate annuity. 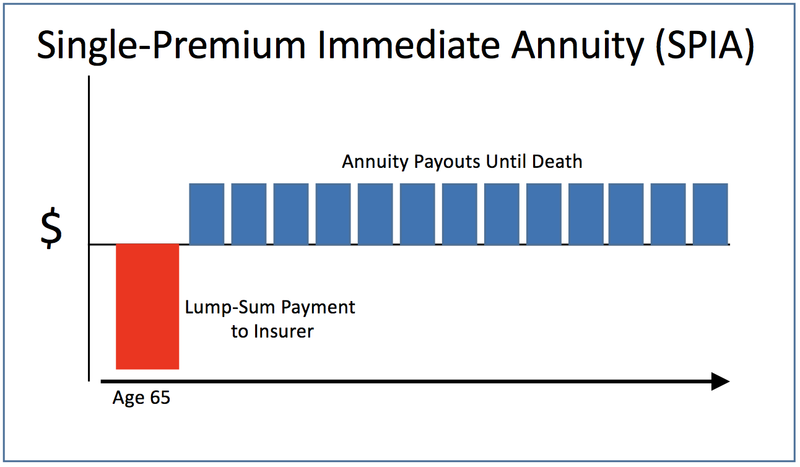 The following diagram shows the problem an immediate annuity can fix. The retiree has only a small portion of income generated from pensions and Social Security and may be exposed to a good deal of market risk in the red area. 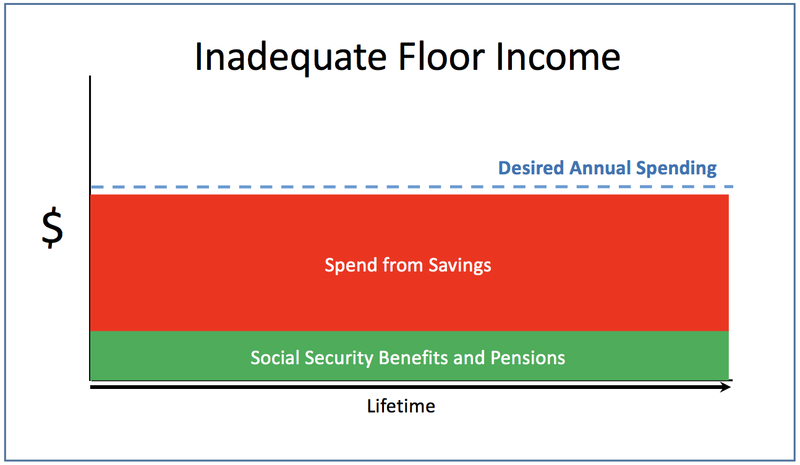 The green "floor" of safe income can be raised throughout retirement with an immediate annuity. Some households may feel that they have adequate income in early retirement but worry that they might not have enough remaining wealth to fund their desired standard of living late in retirement should they live a very long time. Deferred annuities, also referred to as "longevity insurance", can solve that problem. An immediate annuity (SPIA) provides income beginning in less than a year and continues those payouts for as long as the annuitant(s) live. A deferred annuity (DIA) begins payouts at some contracted date in the future if and only if the annuitants survive to that date. 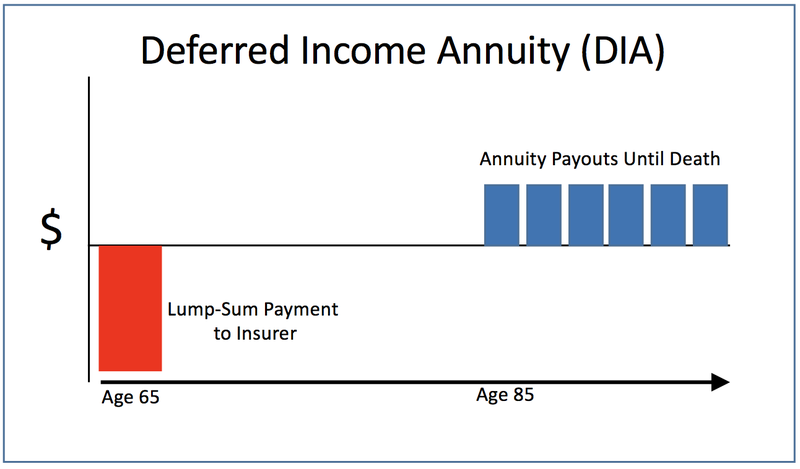 At that time, DIA payouts also continue for as long as the annuitants live, but because the insurer will make fewer payouts with a DIA, and none at all if the annuitants don't survive until the future date, DIAs are a less expensive way to fund late retirement than SPIAs and much less expensive than spending from an investment portfolio. A good candidate for a DIA might be a household that relies on spending from an investment portfolio and is confident that the portfolio will fund early years of retirement but concerned that it will be prematurely depleted. 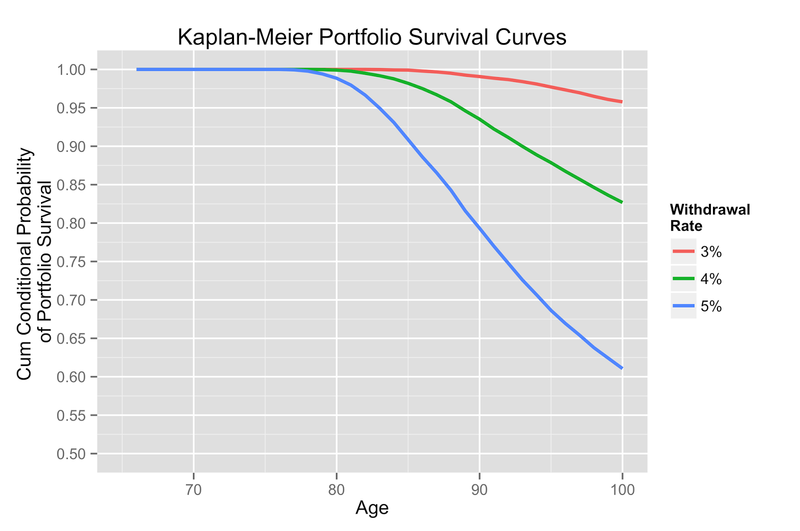 A study my son and I conducted found that depleting a portfolio before age 80 should be quite rare. [3,7] A DIA is a good way to insure income after age 80 or so in the event of a failed portfolio. See how portfolio survival rates begin to decrease sharply (risk of ruin increases sharply) once we reach age 80 to 85? Deferred income annuities can provide cost-effective protection against that increasing risk in late retirement for retirees who depend on an investment portfolio for income. Why buy a deferred income annuity now and defer payments 20 years instead of just waiting 20 years to buy an immediate annuity? Because the DIA will be much cheaper and because there is no guarantee we will still have enough remaining savings to afford an immediate annuity when that time comes. Assuming 3% annual inflation, a 65-year old man could buy a DIA today that would generate $10,000 of income per year in 2017 dollars ($15,580 in 2032 dollars) beginning at age 80 for a one-time purchase of $41,560. An 80-year old could purchase an immediate annuity today that will generate $10,000 of immediate annual income for $91,070. It's much cheaper to buy the late retirement income in advance. The immediate annuity would generate significantly more lifetime income, of course, but it requires more than twice the initial outlay. For households that only expect to need additional income in the event of a very long life, the DIA is the better choice. This is not an apples-to-apples comparison. This assumes that life expectancies and interest rates will remain roughly the same over those 15 years. I have figured in 3% inflation, which could be high or low. The SPIA purchaser will almost certainly receive some income while the DIA purchaser will receive nothing unless she survives to age 80. Nonetheless, the annuitant who does live to 80 will fund income the least expensive way. The DIA is longevity insurance and that's how insurance works. We accept a certain loss (premiums) to protect us from a potentially very large loss (running out of money in late retirement). We pay someone else to accept our risk. Deferred annuities, like retirement finance in general, have an accumulation phase and a distribution phase. But, the phases might be easier to understand if we describe them as two different products.